Firstly. Thanks! I had a truly awesome time. 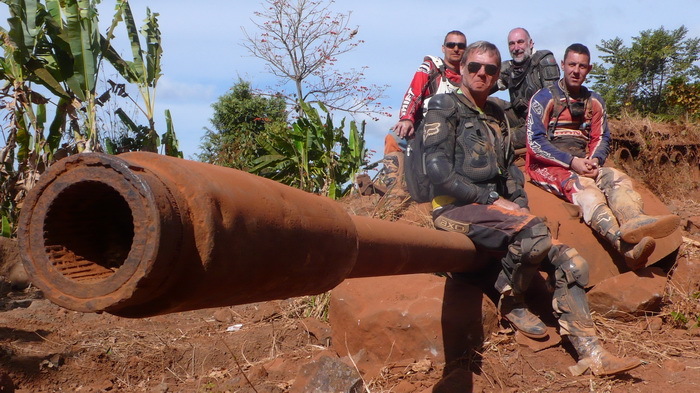 I learnt heaps and have seen my dirt riding skills improve over the course of the adventure. The first day I started pretty nervous. I have been having lessons but was really wondering if I would be able to keep up with everyone out on the trails. The first night with the pig out on the river was really nice. The first real challenging riding I had was when we went of road after staying at the place with the pretty girls next door. I thought I had done well to get up the rock hill but fell at the top., I really was not used to so much weight on the back end. I was thinking then… What have I got myself into. Thanks for the great advice and tips. The advice to stay loose was my manta over the rest of the trip. It helped me lots. Not allowing myself to stiffen up and let the bike do the work made me relax and really start enjoying the dirt trails. The country side was very beautiful and the trips through those isolated village communities was pretty eye opening. The women throwing her baby though the fence and that little girl charging off like the aliens had invaded really brought home how isolated these places were. I loved the swim in the river at the ferry crossing but really must learn how to ride in sand. This was defiantly my weakest skill. Thanks Zang and Rob for picking me up when stuck under the bike. Thanks to you Rob for coming back to help me out when I was stuck and hurting, I hate camping but it was a good experience out in the middle of the jumgle. That rocky road the next day was great. That was the hardest bit of trail I have ever done. I really enjoyed myself on that piece of road. Being lost in the jungle was fun. Pity about all the unexploded crap lying around as finding tracks through the jungle would be good fun otherwise. Flying down those crappy/tracks roads was great. The dust was not a problem as long as we all kept our distance. The lunches on the road were fine. Better when we had the bread rolls but I never was hungry. The food in the villages was good. Even the worst room where I shared with the big spider did us a great meal. It was also amusing to have the entertainment of the US solider telling us about their humanitarian work by removing the fish hook from the kid…. The town where I finally got a massage and had a days break was a relaxing treat. That massage was pretty average but absolutely awesome in context. Driving down the big hill on the last day of dirt riding was great. Once again thanks Rob for being there to help Zang when he needed it. It was great then that everyone pulled together to help get all the bikes home. The last night back in Vientiane was good fun. The museum we went to was very interesting and I really like the shirt I got. The Tuk tuk driver was a cool dude. I really enjoyed that you got us the party room. I had a great evening. I am really looking forward to seeing all the go pro video and seeing the sat nav on Google maps. Once again a special thanks to Rob for all the help he gave me. I lost count of how many times he helped me pick up my bike. Thanks Zang for always coming along last and being there to help out. Thanks for the great advice you gave me and the awesome drive you took us on. Thanks Matt and Tommy for coming on the trip and helping make it something I will never forget.